Exclusive holster design fits all Felco pruners. Steel clip on rear clips over belt or pocket. Genuine Leather, Swiss Made. 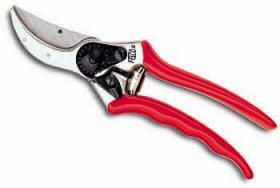 Find the Felco 912 Pruner Holder at Kooy Brothers Equipment Ltd. located at 1919 Wilson Avenue in Toronto Ontario.